May they in Thy glory stand. 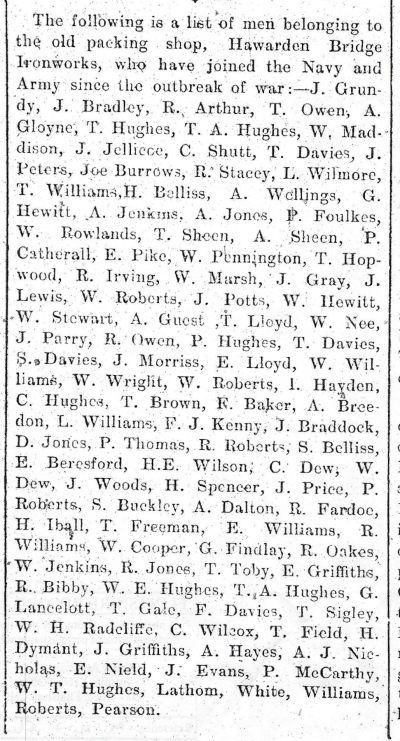 COUNTY HERALD 15th October 1915 – Connah’s Quay & Shotton. Private John Parry Killed – Official news has been received that Private John Parry, 9th Battalion Royal Welsh Fusiliers has been killed in France. Our deepest sympathy is extended to the bereaved parents, who reside at 128, Church Street, Connah’s Quay, in the loss of their only son, who was respected by all who knew him. Before the outbreak of war, he was employed in the Packing Shop Department of Messrs J. Summers & Sons, Ironworks. He was for a number of years a member of the Connah’s Quay & District Silver Prize Band, and a great favourite both with the members of the Band and public. HAWARDEN – Promotion For An Old Hawarden County School Boy. LETTERS TO THE EDITOR – Comforts for Connah’s Quay Soldiers serving in his Majesty’s Service – To the Editor of the County Herald. Dear Sir, – At a meeting of the Comfort’s Committee held on Thursday last, a statement was submitted showing the work and parcels distributed as a result of their efforts, and I was directed to ask you to publish the same in your next issue, as the committee feel they owe this duty to the public. The Committee, which is still continuing its good work, emanates from a public meeting held in the Drill Hall, Connah’s Quay on the 18th August 1914, Councillor Samuel Vickers being chairman of the Committee, with Mrs. Baird Jones, Church Street, Hon. Treasurer and Mrs. E.J. Davies, The Vicarage and Mrs. Charlton, Plas Bellin Hall, as Joint Hon. Secretaries of the Ladies Committee, all of them have worked most assiduously. Yours truly, A.J. Mothersole. – Bank Buildings, Connah’s Quay 2nd October 1914. The Statement referred to above shows that 313 individual parcels were sent comprising 390 pairs socks, 240 hand knitted and 150 (machine knitted), 100 woollen shirts and vests, 36 woolen scarves and other comforts, 102 handkerchiefs, 94 sixpenny packets of cigarettes, 24lbs of toffees and chocolates. Also, 14 x 5s. Parcels to prisoners in Germany; sixteen parcels to wounded in hospital, consisting of tobacco, sweets and fruit, parcels to the 5th, 8th, Dardanelles, and the 9th in France. – Eight boxes of Woodbines, eight dozen of matches, soap, note paper, envelopes, pencils and OXO tablets. Shotton Soldier Killed in Action – The information has been received with feelings of extreme regret that Private Savage, of King Edward Street, Shotton, and who was connected with the local Brotherhood and other movements prior to the War, has been killed in action with the 9th Battalion of the Royal Welsh Fusiliers, on the 25th September, in France. On that day Captain Tom PATTEN, of Shotton, received a letter from Private SAVAGE enclosing some beautiful poetry, he was killed, and as a strange coincidence the 25th September was Private SAVAGE’s eighteenth birthday. The deceased soldier was well known in the Shotton locality, and the greatest sympathy is extended to his relatives and friends in the bereavement they have sustained. Comforts for Local Soldiers – On Friday evening last week a tea and entertainment were given at the St. Mark’s Schoolroom for the purpose of obtaining funds in aid of supplying comforts for the local soldiers. The entertainment was furnished by the Connah’s Quay Masked Minstrels, who made their first appearance in public. Afterwards there was dancing, the music being supplied by the Connah’s Quay Band. Mr. A.J. Cutts officiated as the accompanist to the minstrels. There were nearly five hundred (500) present, and the sum of £30 was realised. D.C.M. for a local man. We learn that Private D. HEWITT, who is a native of Connah’s Quay, and whose home is at Primrose Hill, Connah’s Quay, has been promoted to the rank of Sergeant and recommended to receive the D.C.M. HEWITT was a Police Constable for a time, and stationed at Shotton, and as a Reservist he rejoined his regiment, the Grenadier Guards. For some time before he left for the Front he was on special duty at Buckingham Palace, as one of the body-guard. After being out in France a short time he received promotion to that of a Corporal, and then the Sergeantship, with the D.C.M.., for gallant conduct. – On the 19th October, Police Sergeant DEMPSEY, of the Connah’s Quay Police Station, received a postcard from HEWITT informing him that he was quite well. A Shotton Police Constable with the Welsh Guards. Private R.J. HUGHES, who was a police constable at Connah’s Quay and Shotton up to the time of his enlistment in the 1st Battalion of the Welsh Guards, writing from France, states that he is glad to say he is well after what the Battalion had been through. The 27th September was a day he should never forget. They made an attack at 5.30 p.m., and ordered to take a certain position. They did so, securing a hill and a village which were handed over to the French who were still holding them. He thought that his brother Jesse and himself were the luckiest men on earth, as they went through all the fighting without a hit. He could not say how they had escaped because it was like a perfect hell. They were at the time of writing about five miles from the firing line, but it was not even safe to be there. On the Sunday morning the Germans sent them three “coal-boxes” which made a hole large enough to bury a cart. One of the men sitting outside of the trench which was near received a fracture of a leg. He states he saw “P.C. HEWITT a week last Sunday,” but there was no time to speak to him. HEWITT’s Battalion had also been in action. Apropos of our paragraph concerning the reported death of Sergeant BELLIS, in our last issue, we have been informed that the family have received the official intimation that he is “missing.” We trust that means that the reports of his death are without foundation. GALLANT STRETCHER BEARERS – CARRIED WOUNDED ALL DAY UNDER GALLING FIRE. Among the letters received by Mr. J.H. ADKINS, headmaster of the Drew Memorial School, Hawarden, from old boys – more than 80 of whom are serving their country – is one from Sergt. R. EVANS, of Ewloe, which is of special interest to Hawarden people, as it gives an account of the fine work of his platoon composed mostly of Hawarden young men. He writes: “ I have just got over dysentery and am expecting to got back to the firing-line any time. Our stretcher bearers – the band boys- T. TUCK, E. WILCOXON, Harry WILLIAMS, Griff. JENKINS and T.GRIFFITHS, deserve to class as the bravest for the work they did in carrying the wounded under the most galling fire. I am sorry to say three of them are dead now. I saw two – Harry WILLIAMS and JENKINS. Poor Tom TUCK died in hospital. Harry WILLIAMS was bending to pick up a wounded man when he got it in the head. Both belonged to my platoon. I wish to send my deepest sympathy to his mother and all the family, and also to Tom TUCK’s parents. Douglas TUCK was going on all right when I left him. He has since died. Appeal for Men for the R.W.F. The Flintshire Territorial Association have received letters from Major Borthwick commanding the 1/5th R.W.F., urgently appealing for more men. The Battalion is at present 350 strong, whereas it should be 750. In consequence they have been temporarily linked with the 6th R.W.F. The officers and men are very anxious that they should be brought up to full strength so that they may again become a separate regiment and not lose their identity as the Flintshire Regiment. The County Recruiting Committee and the Association earnestly ask all Flintshire men who are now enlisting to consider the claims of their county battalion. By joining the 5th R.W.F. they will be serving with men of their own districts and will be helping to maintain the splendid reputation which the 1/5th has earned in the Dardanelles. Recruits will join the 3/5th at Whittington, and will remain with that unit till they are fully trained, which will take some months. Men can enlist at any recruiting station in the county, or any information will be gladly given by the secretary. Territorial Association, Territorial Offices, Mold, or any of the recruiting detachments now in the county. Queensferry Man Alive, but Prisoner. Good news has been received of Lance-Corporal George Hampton, of the 9th Battalion, Royal Welsh Fusiliers, who was officially reported missing after the battle of Loos. His parents, who live at Station Road, Queensferry, were distressed to learn that he had “fallen in action” on September 25th. The Lance-Corporal’s chum wrote breaking the news to them, and describing how George was seen going into the charge and how he never returned. The great joy of the parents can be imagined when they, the other day, received a letter from the son supposed dead. He was wounded in the great charge at Loos and taken prisoner of war. Before joining the 9th Battalion R.W.F., Lance-Corporal Hampton was a roller employed in the Staffordshire Mills at Messrs. Summers & Sons Works, Hawarden Bridge. He has a brother fighting with the 8th Battalion R.W.F. at the Dardanelles. For conspicuous bravery, September 25th -29th, near Hulluch. Private PEARCE, one of the regimental stretcher bearers, with great heroism and regardless of all personal danger, brought in wounded men throughout the day and night under heavy and continous fire, carrying many of them on his back. His bravery and devotion to duty were beyond all praise. For conspicuous gallantry on September 26th, at Cambrin, when he went over the parapet, in broad daylight, to look for a wounded man, whom he found 130 yards in front of our fire trenches and 130 yards from the German line. As the man was too badly wounded to bring in, Private BROOKS dug him in with his entrenching too, and then returned for food and water, which he took out to him, bing the whole time under heavy rifle fire from the enemy’s trenches. The wounded man was brought in safely after dark. * Thomas died so young, was he the Thomas BROOKS, AKA ESPLEY who was in the Army, if so, he may have died from the effects of his war service and could have been eligible to added to the CWGC Database, as being brought “In from the Cold,” but the cut-off date was the 31st August 1921.